The images above show comet 67P imaged by Rosetta in April 2015 (top right) and on Sept. 2, 2016 (left). In the Sept. 2 image, captured by Rosetta’s high-resolution OSIRIS camera, Philae can be seen positioned sideways at the base of a large boulder, one of its three legs sticking up into the sunlight. Mission scientists at ESA have been searching for Philae in images taken by Rosetta since its landing in November 2014. The lander’s harpoons failed to fire upon touchdown, causing it to bounce off the comet’s surprisingly hard surface and soar a considerable distance away from its intended landing area. There were several areas that were strongly suspected as being Philae’s final location but this is the first actual visual confirmation of the lander in position on the comet. It was identified by OSIRIS team member Cecilia Tubiana when the high-resolution images arrived on Sept. 4. “With only a month left of the Rosetta mission, we are so happy to have finally imaged Philae, and to see it in such amazing detail,” Cecelia said. Here’s another view of Philae’s location…you really got yourself into quite the spot, didn’t you! 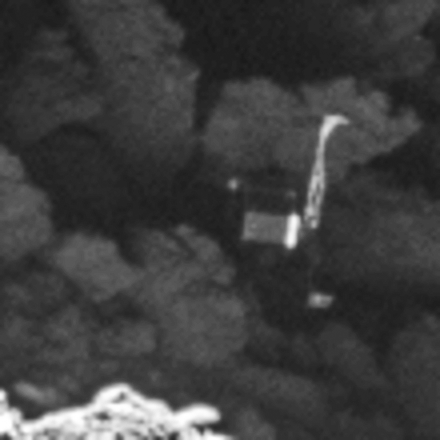 As long suspected, Philae is positioned at a steep angle in the shadow of a large rock. This is the reason its batteries drained quickly after it completed its initial science objectives and it fell silent—there was just no way for it to receive enough sunlight to recharge. After a brief bout of communication with Rosetta in July 2015, the lander fell permanently silent. At this point there is no way to attempt communication with Philae, as the instrument Rosetta used for that has been turned off to conserve power. Rosetta itself only has several weeks left in operation—the spacecraft will be directed into a controlled descent to the surface of comet 67P on Sept. 30, gathering valuable data along the way. After that point it will remain, like Philae, a silent traveler on the comet as it continues its journey around the Sun. Source/read more on the ESA news release here. ESA tweeted this on Sept. 5, 2016.
where is it relative to the old predicted oval? so, they haven’t told yet? I haven’t seen anything specific to that yet.